CIRCUS WORLD drew a typically catty hiss from Bosley Crowther, reviewing for the NY Times, who pronounced John Wayne “without peer in his ability to deliver a line badly.” Well, sometimes, but frankly, if my name was Bosley Crowther I’d be careful whose diction I tickled. 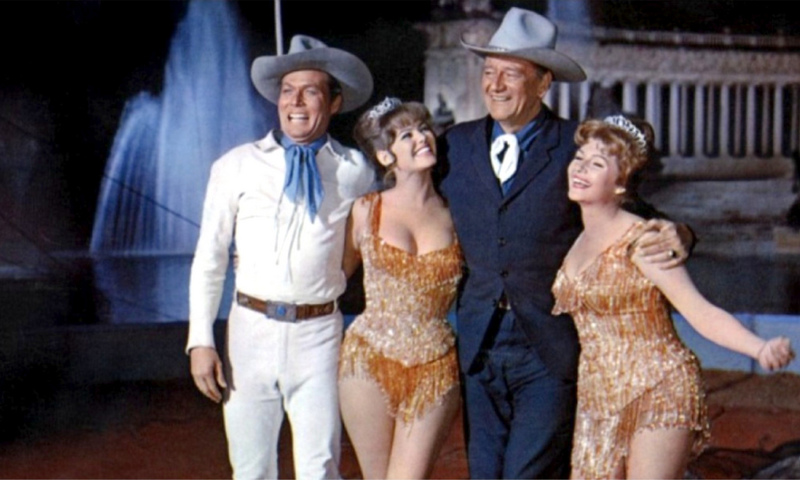 The 1964 movie is a lame behemoth, as the amiable galoot heads a Wild West Show/circus touring Europe in 1901, dealing with the usual Big Top headliner jealousies and can-she-do-the-trick-and-live? acrobatic dilemmas. A fed-up Frank Capra bailed on the project due to conflicts with Wayne buddy/sycophant James Edward Grant’s schlocky script. 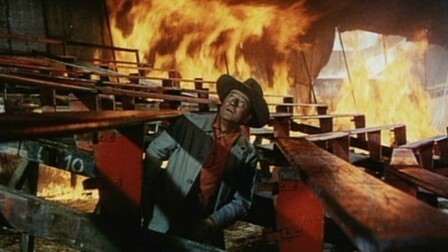 Ben Hecht also banged on the typewriter, then volcano-tempered Henry Hathaway directed. Producer Samuel Bronston coughed up $9,000,000. Coming in at #44 of the years releases, a worldwide take of only $4,400,000, with a terrible draw in the States of just $1,550,000, the flop, along with the greater box-office disaster of his The Fall Of The Roman Empire that same year, killed off Bronston’s movie empire. Wayne ambled through it, although he narrowly escaped being burned alive when filming one of the movies big set-pieces, a massive circus tent fire, ducking out in the nick of time before the whole inferno collapsed on top of him. He was also burned by co-star Rita Hayworth’s temper tantrums, drunkenness and generally abusive attitude.